This is not gourmet AT ALL and I forgot to take a photo of an individual portion on a plate, but this was surprisingly good. Really! I thought that it looked kid friendly and would be simple, but the meatloaf was really tender and moist and Hubby and I actually enjoyed it, too. We sprinkled some cheddar cheese over the top of it before serving and had a nice salad to go with it. 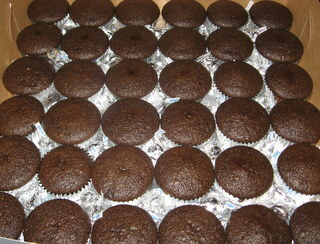 The recipe is from Southern Living magazine and can be found here. 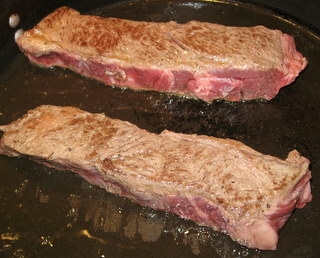 There was a short article on meatloaf variations that included two other recipes. The article can be found here. I have tried the chicken version in the past and was NOT wild about it, but I intend to try the tomato-basil version soon. This recipe is from October 2007 Gourmet magazine. Obviously, I subbed pecans for the hazelnuts. It was really easy and delicious. 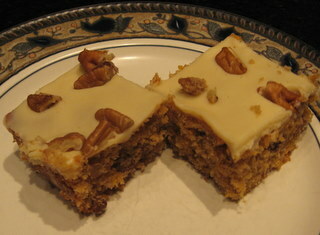 Very similar to carrot cake, but more of a “snack” cake, I would say, than a proper dessert. This was a great hit with Boy and Girl for an after-school snack. Strong ginger flavor and very moist texture. I will DEFINITELY make this again. Any leftovers at our house always seem to wind up in a frittata or a grilled sandwich. Today, I made these for lunch out of our leftover short ribs (plus some muenster cheese), served with the remainder of the fattoush salad from last night. I don’t normally cook a lot of seafood, because Girl hates it and threatens to run away from home, but Boy loves it, so every once in a while I brave the wrath and serve it, anyway. It’s kinda fun to see her wrinkle her nose and gag at the dinner table. Boy was on a field trip in Dallas all day today (seeing the King Tut exhibit), so I wanted to make a special dinner for him upon his return and this one looked like it fit the bill. I wasn’t sure how the lentils would go over, since I’ve only made them once before. But….WOW, was this yummy!!! It was much easier to actually execute than the recipe made it sound. Once I actually started cooking it, it was VERY simple. Sauteeing the fish in butter gave it a lovely, savory browned crust and wonderful flavor. I was afraid that the leek flavor would be too strong (it has a LOT of leeks in it), but the kids both loved it. A couple of other epicurious readers recommended sauteeing the fish in olive oil, to cut the butter content (why would you want to do such a thing??? 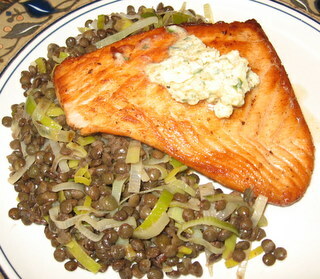 ), but another reviewer recommended added a little pre-cooked, crumbled bacon to the lentils, to add even more sumptuous flavor. I, myself, never pass up an opportunity to monter au beurre or throw in some bacon, so I may adapt a bit when I make this again. I am raising for you a kind young man, without a mean bone in his body. 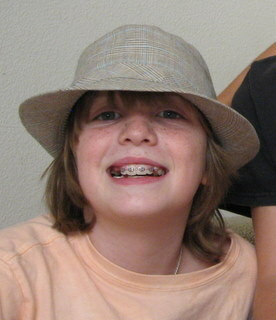 He is handsome and funny and talented and smart. I’m sure that you will love him forever and be very happy, but I must apologize. I have failed you. I have tried to combat a habit that will bring you many hours of frustration, I’m sure, but he is just too strong and I now must finally admit defeat. My only hope is that you are stronger-willed than I am and someday you will be able to successfully train YOUR children to turn their socks right-side-out before putting them in the dirty clothes hamper. Organic produce is more nutritious! Not actually a surprise to those of us who have been supporting the organic movement (which is admittedly pretty mainstream, at this point) for years, but an interesting article, nonetheless. Article about organic produce from Cooking Light magazine. “Conventional” produce is sprayed with fungicides after harvesting, to keep it from rotting in the truck on its way to your supermarket. These chemicals keep it from displaying outward signs of spoilage for a longer period of time. Have you ever picked organic strawberries from a farm or farmers’ market? Ya gotta eat those the same day you buy ’em, baby. They go bad FAST. But strawberries from a supermarket? They’re sprayed with all sorts of chemicals to keep them from rotting. They can survive two or three days on the truck from Watsonville to you and then another two or three days in your fridge. They may LOOK okay on the outside, but it’s only common sense to understand that they will have lost some of their nutrient value from oxidation (not to mention the problem of the added chemicals) after being away from the plant (and water and nutrients) for that long. Another thing is that “conventional” produce is frequently picked when it is not yet ripe (with the idea being that it will finishing ripening during shipping). Of course, produce that is not allowed to finish ripening on the vine (or on the tree, or in the ground, or whatever) will not have the opportunity to develop the same levels of vitamins as organically grown produce, which is more frequently picked when it is completely ripe. The produce will be fresh, out of the ground; it is usually cheaper than organic produce at a supermarket and you usually get to talk to the growers. You can ask questions about how to prepare an unusual vegetable that you might not have ever never seen before, etc. You’ll also get things that are local and in season, but that’s a whole separate lecture. No, you really can’t, at least not usually. Pesticides are sprayed onto the whole plant (where they are absorbed into the plant and distributed throughout), but a lot of it also falls onto the soil. When it rains or the plants are irrigated, the pesticides are washed into the soil, where they can be absorbed into the plants’ vascular system via the roots. Remember, in kindergarten, where you put a carnation flower or a stalk of celery into a glass of water with some food coloring in it? Remember how the dye distributed throughout the whole plant/flower so that the white carnation you started out with became a startling, but beautiful, blue? That is exactly what the pesticides do. They don’t simply “wash off” when you rinse your produce, because they’re not just on the outside of the food, but are imbedded inside. There are some fruits and vegetables, however, that are more vulnerable or appealing to insects, so they are routinely sprayed with higher levels of pesticides to scare away the bugs, or there are some other plants that are naturally more bug-resistant, so they routinely don’t need as much pesticide to prevent bug damage. Some plants, due to a higher water content, absorb more pesticides naturally. So, if all else fails and you just aren’t sold on the idea of organic produce, or only want to spend the money on it at times when it REALLY counts, you should know which fruits and vegetables have the highest concentrations of pesticides and which have the lowest. This data comes from the Environmental Working Group and the whole list (wondering where tomatoes fall? mushrooms? potatoes?) can be viewed here (scroll down a bit). Thanks for listening (is anyone still reading?). I’m stepping down from the soapbox now. Author laraPosted on November 5, 2008 Categories MiscLeave a comment on Organic produce is more nutritious! Yummy and VERY easy. I didn’t put the tomatoes on our pitas, because we were already having a lot of tomatoes in the salad, in fact, Girl dumped her bowl of salad ONTO her pita and ate it that way. Pour over salad and toss gently to combine. Toss in 2 cups coarsely crushed pita chips (recommended: Stacy’s brand, from Costco) and 1/2 tsp to 1 tsp of ground sumac powder (If you can find it. Try Kalustyan’s, if you’re determined to find some.) and toss salad gently again to combine. Sprinkle a little more sumac on top. 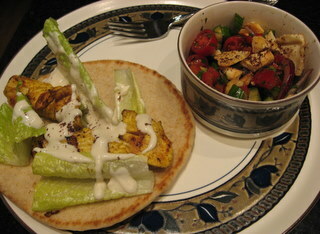 Serve immediately, before the pita chips get soggy. If you’re not serving it right away, reserve the pita chips separately until ready to serve. I am really loving this special Catalon olive blend from Central Market. 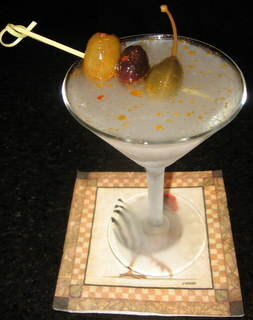 It has a few different kinds of olives, plus caper berries, marinated in a spicy brine. This was VERY rich and flavorful. 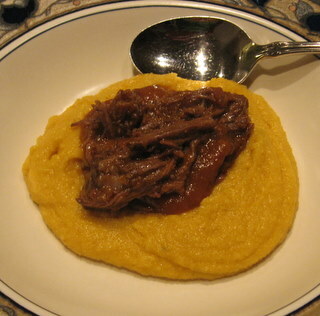 The polenta comes together VERY quickly and the short ribs make your house smell WONDERFUL as you’re cooking. 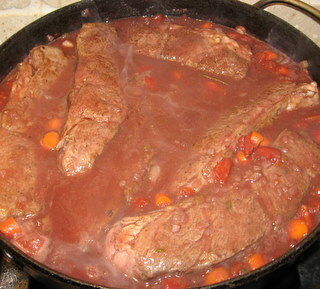 I used boneless chuck short ribs (6 of them) and added more carrots to the sauce, but didn’t add the baby carrots later. I added the juice from the tomatoes, rather than draining it, because I used chicken stock (instead of beef) and wanted to add a little extra flavor to compensate for that. Boy kids enjoyed this and Girl even has some of the leftovers in her lunch today. 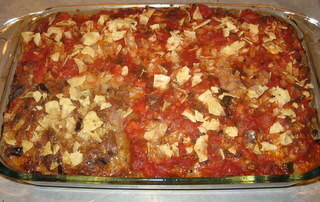 I’m thinking that I may freeze some of the leftover meat and sauce to serve over pasta at a later date. 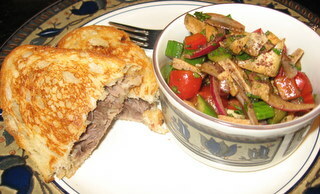 Hubby and I will probably have some of the leftover meat (without sauce) in a grilled sandwich for lunch today.